Celebrate Water Week - May 5-11th, 2019 The Water we Drink For information on events during Water Week go to www. waterweek. org Has your account information recently changed? Please contact us at 801-968-1011 to update your account KID’s RV Dump is Open It is located at 5980 West 5400 South on the north side of the road. EQUAL PAY CUSTOMERS, please note any changes in your equal payment amount and make any necessary adjustments if your payments are made automatically. Are you ready to chase down leaks? Household leaks can waste nearly One Trillion Gallons of water annually nationwide. Join us during Fix a Leak Week, March 18 through 24, 2019 to find and fix leaks inside and outside your home to save valuable water and money all year long. Equal Pay Plan OPEN ENROLLMENT is NOW! If you are interested in participating, contact our office at 801-968-1011, Before the end of open enrollment, which is your January statement due date, After a snowfall, remember to clear a three-foot radius around fire hydrants near your home, this will aid the fire department to rapidly locate it in case of a fire emergency. . Prevent frozen lines Remove all hoses from outside faucets. When the temperature drops to 20 degrees or below, help prevent frozen water lines by leaving an inside tap dripping overnight. Open cupboard doors to allow heat to pipes near outside walls. KID RV dump will be closed Nov 1st- 2018 -March 31st, 2019 for the winter season. Now is time to turn your stop and waste valve to the “off” position! This valve “stops” the water and lets the remaining water in your main sprinkler line drain, or “waste”. This will prevent freezing and rupturing of your main sprinkler line and by making sure it is off completely you’re eliminating the possibility of a leak during the winter. Conserve water, shower better! By switching to a Water Saving Showerhead You could save 2,900 gallons of water per year If you qualify, you can pick up your showerhead in our office during regular business hours, first come first serve during the month of October. Fill out an application to receive a FREE showerhead (applications are available in our office or online at kearnsid. org) Looking for a fast and convenient way to pay your bills? Xpress Bill pay iPhone FREE App is now available! SIMPLE, BENEFICIAL AND FREE! Go to iTunes and type in “Xpress Bill Pay”. Kearns Improvement District is offering a FREE Water Efficiency Kit to customers of Kearns Improvement District. Stop by our office to pick up your kit today and continue to save water! Limit one per home. Follow the outdoor watering guide for Utah at https://conservewater. Watch for our booth at Party in the Park on Saturday August 18th from 4:00-7:00 pm at Jordan Valley Water Conservancy District 8275 South 1300 West. IT PAYS TO SAVE! Start saving water and money on your landscape or in your home. 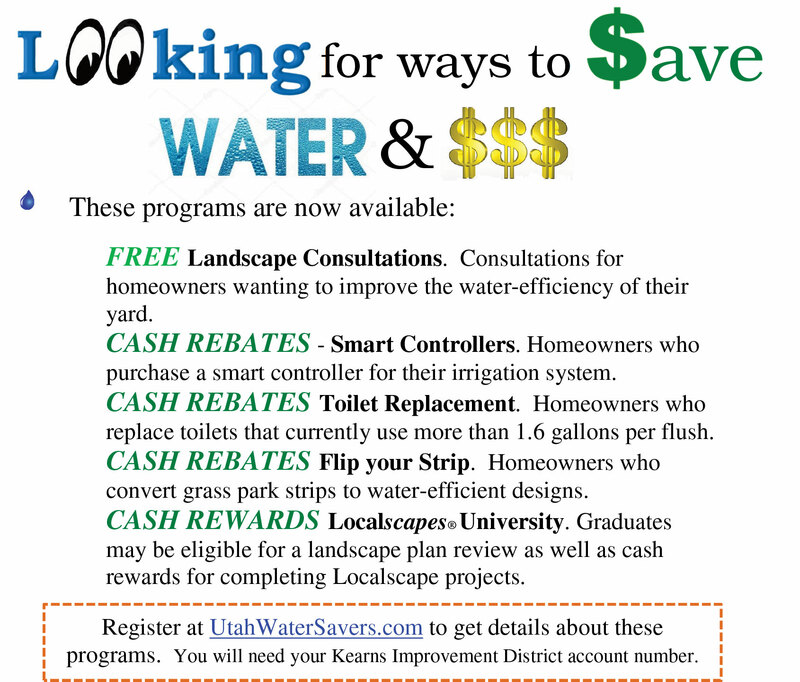 Create a Utah Water Savers Account to view cash rebates and programs such as toilet and smart controller rebates, landscape consultations, Flip your Strip, and learn how to save water outdoors. Read in full HERE . Dear Customer, Kearns Improvement District (KID) is committed to providing high quality drinking water that meets or exceeds state and federal standards. Each year we publish our Water Quality Report showing water sampling results for the previous year. The Water Quality Report is available online.